Erected in 1836 by General M. G. Vallejo. Headquarters of Bear Flag Party which on June 14, 1846 proclaimed a "California Republic" and raised the Bear Flag on Sonoma's plaza. Twenty three days later, July 7, 1846, Commodore John Drake Sloat representing the United States government took possession of California. In April 1847 Stevenson's regiment, Company "G," U.S.A. occupied the barracks. 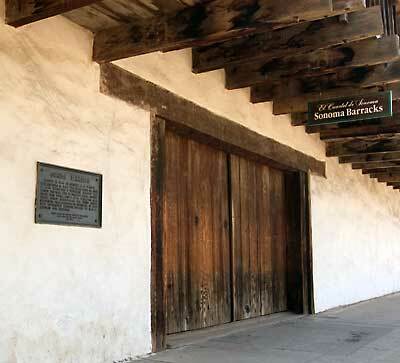 The Sonoma Barracks building contributes to the Sonama Plaza Historic District National Register Listing #75000489.